Former athletes Dustin Smith and Shad Martin, however, want to challenge athletes to do more … much more. They created a program called Especially for Athletes (E4A) meant to encourage those who play sports to get the most out of themselves both physically and socially. Arrogant, dumb, inconsiderate, shallow, self-centered, all about winning. But anyone who spend any time around athletes know that there are many who break this mold. Former athletes Dustin Smith and Shad Martin, however, want to challenge athletes to do more … much more. They created a program called Especially for Athletes (E4A) meant to encourage those who play sports to get the most out of themselves both physically and socially. In the opening activity, Smith started out by talking about many of the challenges faced by high school athletes: Cheating, drug use, bullying and suicide. “It’s time for athletes to step forward and make a difference,” he told the crowd. 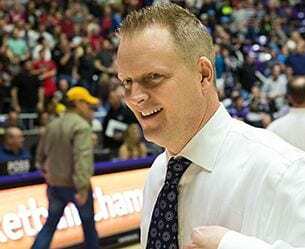 One of the guest speakers at Friday night’s kickoff was Lone Peak head boys basketball coach Quincy Lewis, who won the Naismith National High School Coach of the Year award this year. Lewis told athletes and their parents that were in attendance the importance of having a championship mentality both on and off the field/court. Lewis believe that these type of programs can have a big impact on youth in both their sports careers and their daily life. Smith and Martin, the co-founder, have seen the movement grow over the past couple of years and it includes the support of some big-name sports figures like Gordon Hayward of the Utah Jazz and former BYU Heisman Trophy winner Ty Detmer. Other well-known athletes and coaches who have backed the program include Ben Cahoon, Harvey Unga, Brandon Ogletree and Tiffany Bird. Athletes from BYU, Utah, Notre Dame, Stanford, UCLA and other major colleges have also taken on the challenge. Cougar sophomore quarterback Ammon Olsen was in attendance at the event Friday night. Smith said the whole idea for E4A started when he and others realized some of the opportunities that they missed during their sports careers, particularly in high school. The program is specifically aimed at athletes, who often have already discovered the benefits of hard work and pushing themselves. Martin and Smith both talked about how during this time many of the athletes have the spotlight — or “sportlight” as they call it — on them and that gives them the ability to have a significant impact even through small actions. The mottos of “Eyes Up” encourages them to look for opportunities, while the motto of “Do the Work” is a reminder that action is required as well. During his portion of the presentation, Martin reminded the athletes to get great grades, that they should be making a new friend every week, to extend the team, to wake up early to improve something and to find those who need help. For more information including the full pledge made by each of the athletes who commits to the ideals, go to especiallyforathletes.com. Gordon Hayward: A Great Example of an Athlete Who Lives His Life with his Eyes Up! Negative news cycle, dangerous political attitudes. What is truth, and are our children paying the terrible price?